Once the local farmers harvest and dry the corn grown for the Hudson Baby Bourbon, they grind it, add water and cook the mash for fermenting – creating a round flavor and balanced palate. Baby Bourbon is left to mature in their signature small charred new American oak barrels, giving it a uniquely rich amber color. Small barrels mean more wood contact, which accounts for its rich, oaky, smoky flavor profile. 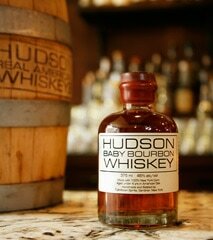 Hudson never charcoal or chill filter their bourbon, giving you a full-flavor experience. ​You’ll also recognize subtle notes of vanilla and caramel.